A noted public speaker and academic from Tamil Nadu brought Gandhiji’s message of non-violence, tolerance and constructive social work to the people of Jaffna. COLOMBO: Even as ethnic relations in North and South Sri Lanka were getting vitiated again due to a growing culture of intolerance fomented by certain politically ambitious groups both in the Tamil majority North and the Sinhalese majority South, a noted public speaker and academic from Tamil Nadu brought Gandhiji’s message of non-violence, tolerance and constructive social work to the people of Jaffna. 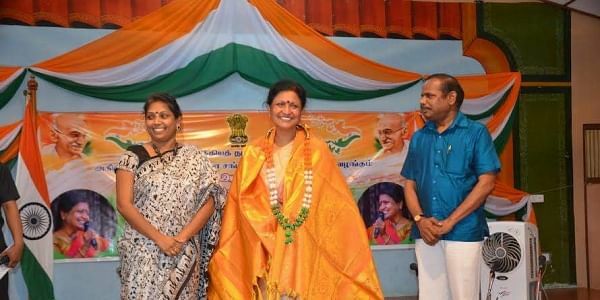 On Gandhi Jayanti this year, Dr.Mrs.Jayanthasri Balakishnan of Coimbatore addressed a gathering of over 500 distinguished residents of Jaffna, courtesy the Indian Consul General A.Natarajan and the All Ceylon Gandhi Sewa Sangham. The audience comprising Gandhians, intellectuals, writers, artistes, political leaders and students, heard with rapt attention as Prof Balakrishnan expounded in chaste and mellifluous Tamil, the significance of Gandhiji’s doctrine of ahimsa, peace and harmony for the present day conflict-ridden world. Earlier, local artistes dressed in white, played Gandhiji’s favorite hymn ‘Raghupathy Ragava Rajaram’ on the veena. School children sang patriotic songs. In a sense, Prof. Balakishnan brought back to the people of Jaffna nostalgic memories of the Mahatma’s visit to the town in late November 1927. The house in which he stayed has been renovated and preserved by the famous Sri Lankan Tamil architect Anjalendran. When Indian Prime Minister Narendra Modi visited Jaffna in 2015, those who had done up the house with loving care, wanted him to visit it however briefly. But that was not to be because of the Prime Minister’s crowded program. “Even a three-minute visit by Modi to sign the Visitors’ Book, would have been of great political significance to us,” said M Sooriasegaram, an engineer who tried to get the Indian PM to come to the historic house located at 199, Temple Road, Nallur, near the famous Kandaswamy Temple. “The visit would have underlined India’s historical ties with Jaffna and the Tamils of Sri Lanka, at a time when sections of the Tamil National Alliance (TNA) are decrying the TNA leadership’s penchant for close links with India,” Sooriasegaram told Express. One of the oldest “courtyard houses” in Jaffna, the vast house belonged to the family of the maverick Jaffna politician C.Suntharaligam. Unable to see it go to seed because of the 30-year war, a famous Tamil architect, Anjalendran, took up the onerous task of restoring it to its past glory. “Anjalendran undertook the restoration work meticulously, standing at the site for hours together each day. Today, it is home to an association of architects, artists and lovers of art and literature. Its vast, naturally lit and airy courtyard, is to used to host meetings,” Sooriasegaram said. Gandhi arrived in Jaffna on November 27, 1927 along with wife Kasturba, his secretaries Mahadev Desai and Pyarelal, Rajaji, and the latter's daughter, Lakshmi and toured several towns in the district. He had been invited by Handy Perinbanayagam, founder-leader of the Jaffna Youth Congress and an advocate of Poorna Swaraj for both Sri Lanka and India. In his speeches in Jaffna, Valvettithurai, Thondaimannar, Point Pedro, Manipay and Chavakacheri, Gandhi avoided politics and stressed the need for social reform. This is significant even today, as caste-ridden Jaffna is in dire need of social reform. But the concentration of its elite and its political leaders has been on achieving political goals rather than social and economic reform which would address the day to day needs of the common man.